The faculty at Whitecliffe College of Arts and Design actively educate and discuss the concept of sustainability with their students through innovative and creative programs. One such program, Seed to Self Matatika, teaches ethical and sustainable practices to students who are passionate about making a positive change in the fashion industry. Seed to Self Matatika aims to “shift the paradigm in the textile industry to a socially and environmentally sustainable future” by offering young designers a hands-on experience with the fashion supply chain. 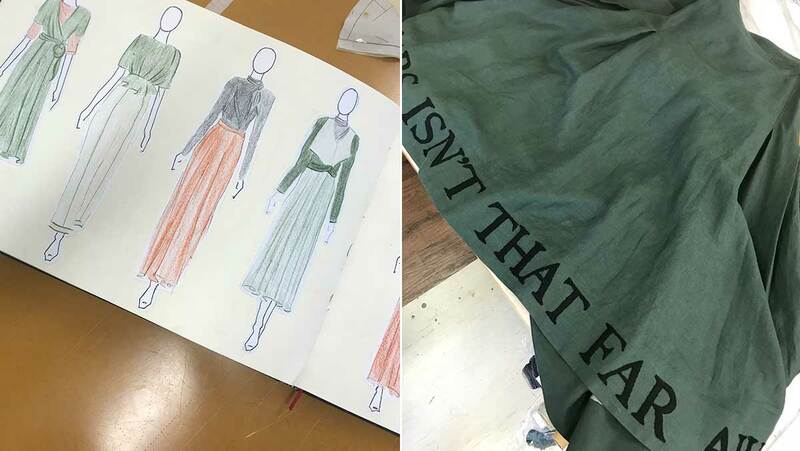 Students design a collection that represents ethical practices across environmental, social and ecological platforms. All students participating in the project travelled to India in 2017 as recipients of the Prime Ministers’ Scholarship for Asia, where they experienced the supply chain first hand as well as craft workshops working with artisans, an experience that has impacted their current design practice. Students who have been lucky enough to travel to India also worked collaboratively with students from Pearl Academy in Deli, India. When we spoke to some of the fourth-year students at Whitecliffe who took part, they were surprised to learn the different meaning sustainability had in India. Generally, for a typical Kiwi, “sustainability” means environmental factors, but for those working in India, it also means sustaining their way of crafting garments and the materials, tools and traditions. Whitecliffe also offered students the opportunity to attend the United Nations Copenhagen Fashion Summit to discuss sustainability initiatives with like-minded global changemakers. The summit gave the opportunity to confront fast fashion companies and like H&M and hear their initiatives in decreasing pollution and wastage. “As a designer coming from Whitecliffe, I personally think we are far more focused on changing the future for the sake of saving the environment versus other nations that are still strongly business and money driven,” Anastasiya Baranova, a student at Whitecliffe who went to the summit, explained. We spoke with some fourth year Whitecliffe students from the Seed to Self Matatika program to discuss their final projects and why focusing on sustainability is important to them. “To ensure my designs are ethical I look at traceability and transparency when researching about companies and materials before I make the decision to design garments,” Anastasiya Baranova says. “I believe honesty within any company is important. My greatest piece of advice when purchasing fabric or even buying a garment is to see how open a company is when it comes to discussing their working conditions and environmental footprints. “I have personally travelled to India to make connections and witness working conditions. I’m able to say that the natural fibre materials I’ve sourced are organic and naturally dyed and come from companies who care for their supply and value chain. They have no problem telling me how and why what I am buying is ethical and sustainable. “10-20% of fabric is wasted in the cutting stage of a garment alone, so it seems clear to me that the fashion industry perceives fabric as a disposable resource,” Jessica Jay says. “This waste is then either dumped in a landfill, contributing to pollution and environmental degradation or recycled. Although recycling is undoubtedly the more sustainable and ecologically sound option of the two, it fails to mitigate the fundamental inefficiency of current fashion systems by focusing on the optimisation of only one small segment. “Zero-Waste design is central to my practice as a fashion designer because I feel that minimising waste in the fashion sector is the first step to creating a more sustainable industry. 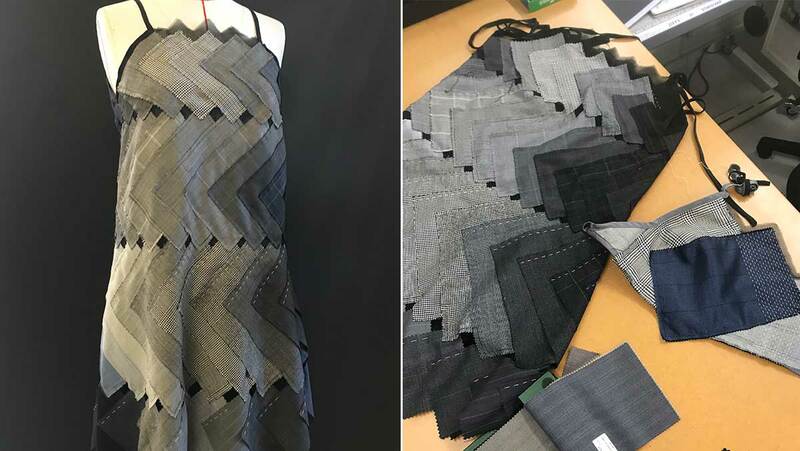 The majority of my patterns are designed for zero-waste using a geo-cut technique which means that my pattern pieces are comprised of large squares and rectangles which I then drape onto the body to give dimension and shape to my designs. I also use a jigsaw technique with items such as trousers and jackets, so each pattern piece fits together on the fabric to create minimum wastage. 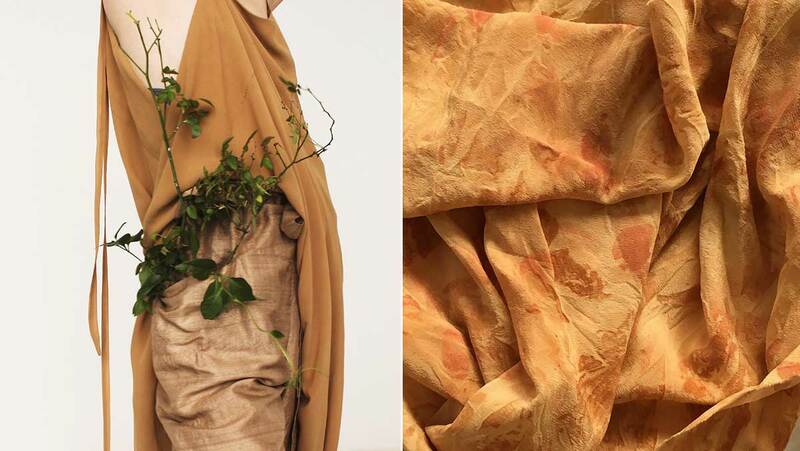 “Additionally, I use only natural fibres so that any scraps produced in the production of my garments can be safely composted, closing my design loop biologically. My goal is to produce less than a handful of textile waste per garment to aid in reducing the ecological impact of my design process. 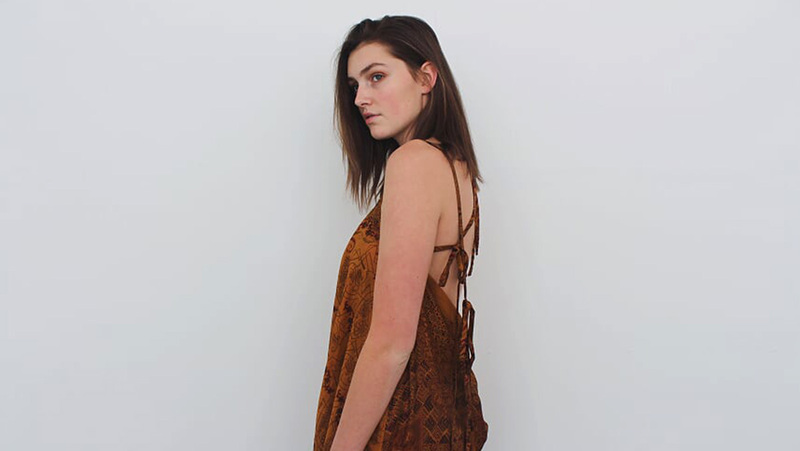 “Using natural fibre’s in my collection is a key part of my practice as a designer,” Annaleigh Stafford says. “I strive to design and create garments that have minimal impact on the environment. I found it relatively easy substituting man-made fibre’s for natural as it is all about the selection process while designing. “As a young designer coming into an industry with many flaws that are often glossed over, I found that it was imperative to address the events and effects that have been a result of mass production and consumption. I did this by adopting a newspaper headline text to hand embroider statements such as “Mars isn’t that far away” to draw attention to the viewer to contemplate such an open-ended statement. “For my 2018 collection, I chose to use solely dead-stock, secondhand, and up-cycled materials,” Bridie McCree says. “According to the Environmental Protection Agency in 2012, 13.1 million tonnes of textiles are disposed of every year, and only 15% of that waste is recycled. There is a wealth of pre-consumer and post-consumer waste that is perfectly usable, that’s what I’ve chosen to draw from in my collection in order to reduce our contribution to the wastage in the world. “My collection is called Aleph which is the first letter of the Hebrew alphabet and a symbol my mother has tattooed on the middle finger of her right hand. The letter is strongly linked to The Fool card in the Tarot deck, my mother’s favourite card, and the favourite of one of my closest friends who I lost to suicide last year. “The Fool is a card in which the dual elements of the fool himself and the sun on his back represent the alpha and the omega, birth and death, and the beginning and the end. The card, when drawn, is a reminder of the sun on the back of the adult with scraped knees and no one to kiss them better. 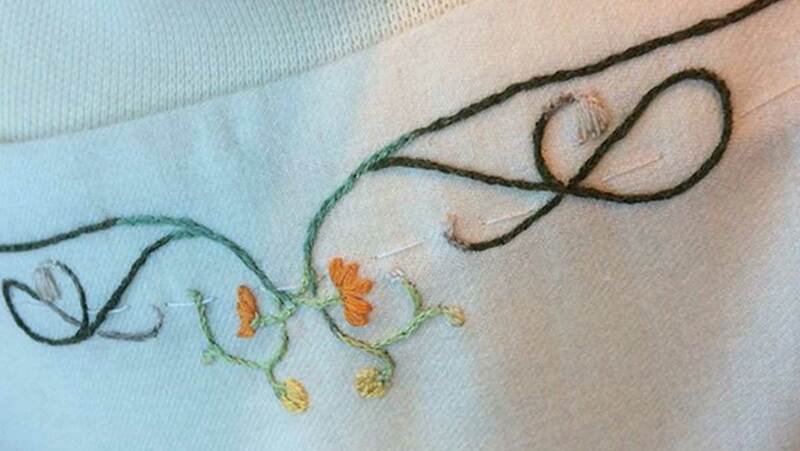 Soft fabrics, hand-embroidery, and the aesthetics of a five-year-old’s Sunday best are a reminder of motherly love. “The concept behind my designs for my collection (TBC SS18/19) is based on the Kaizen philosophy of continuous improvement, and its parallels to Wabi-Sabi philosophy, and the slow approach to fashion in valuing the process of making, and up-keeping a garment,” Georgia Rahui said. “My aim is to address the wasteful state of the fashion industry by using conscious material sourcing, upcycling and slow handcraft processes to foster value and longevity in garments. “My aim is to return to the value for frugality, and the emotional engagement with repair and repurposing, for how it promotes personal connection to garments and fosters the continual renewal of a garment’s form. For more information, visit Whitecliffe.ac.nz.